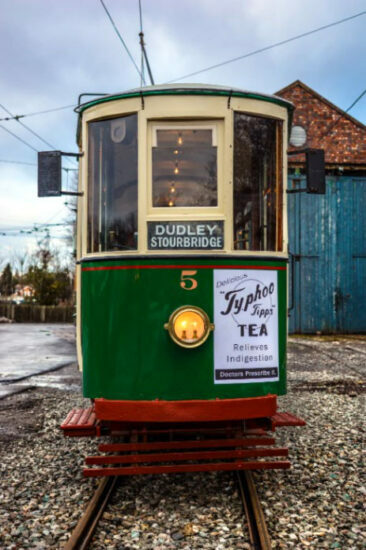 Dudley, Stourbridge & District 5 has returned to service at the Black Country Living Museum following the completion of its £120,000 overhaul. The tram re-entered service on Monday 18th December at the culmination of the five year project to get it back to the tracks. 5 – a Tividale type of tram, typical of many trams which ran in the Black Country – was built in 1919 but also lasted around 10 years in service before the Dudley system closed and it was sold on for further use. In 5’s case this was a shed in a garden in the Kate’s Hill area and that is where it was discovered in 1974. It was restored to operational condition and became the very first tram to run on the 3’6” gauge tramway at the Black Country Living Museum in 1980. It remained in service until the early 2000s when 20 years of intensive service had taken its toll and it was in need of some more attention (by this time similar Wolverhampton & District 34 had entered service). 5 remained stored our of use for a number of years until it departed Dudley for the Llangollen Railway on 22nd February 2012 for a start to be made on a full restoration. It remained in Wales for over four and a half years where the bulk of the work was completed before it headed back to the Black Country Living Museum in early November 2016. The intervening period has seen the last push to return 5 to the tracks and after extensive testing Monday 18th December was the day was saw the tram carry its first passengers for many years. The restoration has been made possible thanks to donations from individuals, businesses and trusts and foundations including the Friends of Black Country Living Museum and the Black Country Living Museum Transport Group. The total project has cost £120,000 and the work has included the rebuilding of parts of the bodywork and structure along with attention to the motors and brake rigging. To finish things off a fresh and shiny coat of paint has been applied in the traditional dark green colour. There should now be three trams available for service with 5 joining 34 and double decker Wolverhampton 49 but only one is needed on a normal daily basis. It is planned that 5 will be running between 1100 and 1500 all this week. The museum also has an operating trolleybus route. Looking resplendent in a fresh coat of paint Dudley, Stourbridge & District 5 waits at the end of the line. Wolverhampton 49 is seen behind. An end view of 5. The stunningly restored interior of 5. This entry was posted in Black Country Living Museum. Bookmark the permalink.